I use BlackBoard as well at my university on my Linux computers. I've noticed that I will be set as unavailable for chat by default, while on Windows its default is available. I also couldn't get the chatroom feature to work. It's more than if it works or not. If they listed it as supported then they would have to answer tech support questions about it and they probably don't have the training to do that. The place I did my 2008 taxes (TurboTax at their website taxfreedom.com, the only one I was qualified to do free e-filing for state and federal taxes) would not let me in, because I didn't have a supported browser, because they only had supported browsers in Windows and Mac OS X. However, when I altered the browser settings (general.useragent.vendor) to report my browser as being firefox in Windows, it let me file my taxes with no problems. This core issue here is that the Blackboard people GET PAID for this by both Microsoft and Apple. Since there is no one to pay them for listing anything Linux-related, they don't bother. All Mighty Dollar being worshipped here. I came across a blog ("Blackboard - No Linux for Education") the other day that outlines (with pictures) how a Linux-using college student was given error messages when using the blackboard from his GNU/Linux computer with full-open-standards/open-web-per-w3c.org compliant Mozilla Firefox Browser. As a technology professional and college graduate myself, I am very disappointed to see such a blind and disparaging abuse of technology. To require people to have a specific operating system to look at the Internet;This is an assault on the very basic ideal of education and technological evolution for humankind. And since blackboard has made it this far, I thought I'd let you know about it. Mozilla's Firefox solely exists to deliver a Standard, Open Source, and Web Standards compliant browser for everyone to use on just about any platform of their choosing. And this benefit continues to grow, naturally, to even more platforms. To tailor technology to a certain greedy company's specs in this day and age is not only ignorant, it is, in my opinion, a sure sign of corporate abuse of power, and bad corporate citizenship. The world and technology are changing Mr. Chasen. The web is for everyone. Please make your products work with Firefox(non-platform-specific) first, and thus serve the world with your technological contribution. The current version of Blackboard Learn&tm; v9.x does not include these checks. The current Blackboard user interface was designed with web standards in mind and should generally work with any browser that supports more recent flavors of ECMAScript, HTML 4.x and CSS v2. Blackboard's current support policy is designed to communicate the specific browsers and OS configurations that are tested and that the support teams have available for issue replication and diagnosis. The check noted above is only relevant to customers running the WebCT product family. I run Blackboard/WebCT through Linux all the time (using both Firefox and Chromium), and have never had a problem. Yeah, if I run the browser check, it reports a failure, but everything seems to work. I use Linux (Ubuntu 10.04 64bit and Maemo) with Blackboard for my school (KCTCS.edu). It works fine for Firefox 3.0, 3.5, 3.6, and 3.7 on Ubuntu 64bit, MicroB and Opera 10 Maemo, as well as Chrome(ium) limited support (small glich with text input at times). It works fine. If the community says "it works," it would make sense to me if they added it to the list with saying "as reported by the community." The only service I've used for college that didn't work 100% was MyITLab. It had a browser check script, checking for IE6 (really. It was recomended. :/ )or better. One useragent switch later, it worked except for one web test (full screen flash app that was supposed to launch never did). Still, I had a VM of Windows 7 (license provided for free by the school) that I used for that 1 test. As a side note, I'm going to get in touch with my school's IT, that way at least ours can say somewhere that Linux is compatiable with these browsers on their Blackboard install. I'm using Blackboard at my local college and receive the same message on my Debian laptop. Like you, I see this type of message all the time and just "click" through it. I've actually contacted Blackboard support regarding this issue by email but I'm still waiting for a reply. Honestly, I'll probably never get a response. 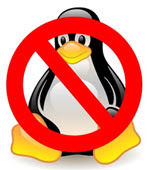 As a Linux-only person for more than 11 years, non-acceptance by software companies is becoming increasingly frustrating. I have to use blackboard for my classes and it works perfectly. I think you have to use the non-free version of java. I know java has to be up to date and pop ups allowed on the browser. I can't believe that nobody has mentioned Moodle. Heck, we use it all over our neck of the woods. Blackboard was purchased by Microsoft and they serve their masters well. Schools with tight budgets are foolish to pay for it. Opt out. Just say no. For those of us in the world who do not develop web-based software, it is important to note that every web browser has quirks and that to thoroughly test a product having the complexity of Blackboard likely takes thousands of hours per browser per OS per version. The market share of Linux on the desktop is extremely low and unfortunately is probably not worth the cost of performing this level of testing. Only officially supporting certain browsers is a tactic that many vendors - not just Blackboard - use to control development and maintenance costs. I'm aware of this. I'm not asking for "official support" just a marking of "compatible" like they do for browsers on other operating systems. When I was a graduate student at Podunk University a few years ago, I just didn't use Blackboard for the classes I was teaching, I had my own set of web pages, written via emacs, that complied with the web standards, I even made sure they rendered OK under Lynx. I am too damn stubborn to spoof my browser's ID tags (I'm using Konqueror right now). I'll send an email to whomever the "webmaster" is and, depending on my mood at the time, which determines my diplomacy, tell them that there web-page is broken since it doesn't work for all browsers. Sometimes I get cranky and make some less than diplomatic suggestions (like, for example, the kid that lives next to me will probably be willing to rewrite the web pages for you), and sometimes I am diplomatic about it. I find it hard to believe that the "browser wars" of over a decade ago are still going on... they've gone underground, but there might as well be a "optimized for IE6" tag on some of the websites out there. The bottom line, if I can't read a website using Konqueror, Iceweasel (yup, I'm a Debian guy), Midori, or Chromium (yes, Chromium and not Chrome), identifying the OS as a Linux OS, forget them. The major businesses out there know that it is in their best interest for their web pages to be read by all browsers, if someone wants to be "optimized for WiNdOwS", then they are not on my radar. It is so ridiculous. I have accessed Blackboard through Mint, Ubuntu, Xubuntu, and Debian with Firefox and Chromium for years through two universities. I have much less problems than people who use Windows/Explorer, etc.